Full Moon and Friday the 13th: Not so rare after all. A Spooky Friday the 13th Full Moon … Or Is It? Did you see the full Moon last night and this morning? It was pretty much like all full Moons—that is, silvery and big and gorgeous—but if you have a mind for such things, it may have occurred to you it happened on Friday the 13th. If you’re on social media, you may have seen some links to this fact, claiming it’s a rare event. Well, yeah, it is. But being rare doesn’t make it special! A full Moon on any given day of the week on a given date is rare. This event is no more rare than having a full Moon on a Friday the 12th, or a Tuesday the 27th, for that matter*. What’s funny to me is that as you read this, the real moment the Moon was most full was actually last night. That occurred on Friday, June 13, at 04:11 UTC … but that’s just after midnight EDT, and for me, in Boulder where we’re on Mountain time, it actually happened on Thursday night at 10:11 p.m. Living on a round ball makes telling time a bit tricky. The video above shows the appearance of the Moon as seen on Earth, hour by hour, for 2013. That should give you an idea of how the phases change, if you’re not familiar with them. The full Moon occurs when the Moon and Sun are opposite each other in the sky. Due to the geometry, from our view on the Earth in between them, at that time we are looking on the Moon’s fully illuminated hemisphere. Mind you, half the Moon is always lit by the Sun! But as the Moon orbits the Earth different parts get lit, and we get a different angle on the illuminated part. When it’s between us and the Sun we’re seeing the unilluminated part, so we call it new. Over a few days it grows to a crescent, then half full, then gibbous, then (two weeks or so after it was new) we see it as full, a lovely bright circle in the sky. After that the phase reverses, and it goes through gibbous, half full, and back to new again. So there is a moment when it is most fully illuminated from our view on Earth, and we say it’s full. That’s what I mean when I say the Moon was full on Friday, June 13 at 04:11 UTC. That’s the moment it was most full. However, if you go out tonight it’ll still look pretty full. It can be rather difficult to see the difference in only a day. 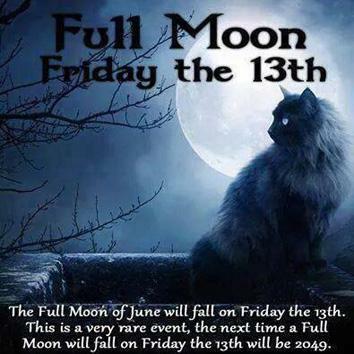 So yes, a Friday the 13th full Moon is rare, but not more so than on any other date. And it wasn’t even necessarily on Friday the 13th, depending on where you live. But we’re not done with the meme yet. A few places I looked claimed that there won’t be another full Moon on Friday the 13th until 2049. But that’s not strictly true either. For example, there will be a full Moon on Thursday, January 12, 2017, at 11:34 UTC. But anyone in the +11 or +12 time zones (New Zealand, and the extreme eastern part of Asia) will see this event as happening just after midnight on Friday the 13th. Not only that, the Sept. 14, 2019, full Moon falls on a Saturday … but at 04:33 UTC. That’s before midnight for most of the U.S. (including where I live) and points farther west, which means they’ll see it as being on Friday, Sept. 13 (coincidentally, the 20th anniversary of the Moon being blasted out of Earth orbit). I’m sure I could find more if I dug into it a bit. The point? Don’t believe everything you read on the Internet. The real world is generally a bit messier, more complicated, and more detailed than a simple meme getting passed around via Twitter and Facebook. But then, that’s part of what makes the real world so much cooler than we give it credit for. My hearty thanks to Randy Owens for pointing me toward this urban legend, and also for digging up the two dates for the next triskaidekaphobic lunar apparitions. *Though I’ll note that a full Moon on the 31st of a month is more rare than having it on the 30th. Can you figure out why?